The key sign of OPEC’s success may finally be here. Since the Organization of Petroleum Exporting Countries embarked on its strategy to clear a global glut, analysts from Goldman Sachs Group Inc. to Bank of America Corp. have said that one critical indicator would show the plan is working: the discount on immediate crude would turn into a premium. That condition known as backwardation signals demand is outpacing supply. This pattern is becoming increasingly visible in the market for Brent futures, the international crude benchmark. On Wednesday, the front-month Brent contract was more expensive than the second-month contract for a second day, a situation last seen in April 2016, and the trend is spreading to subsequent months along what’s known as the oil futures curve. 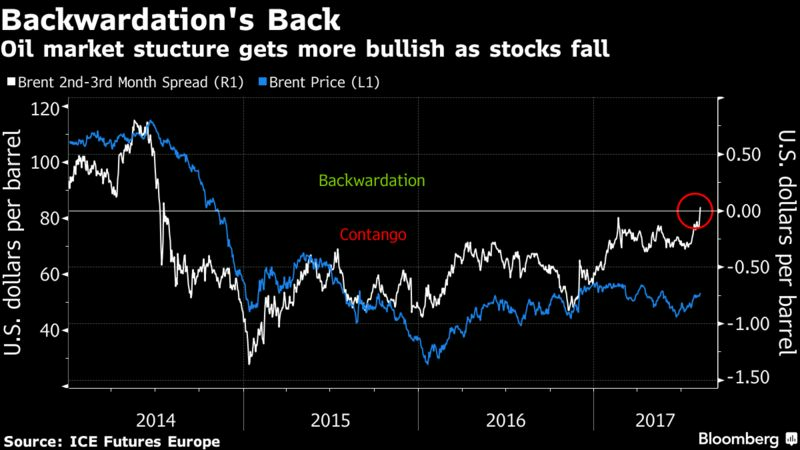 Oil prices have lost about 6 percent in London this year as production cuts by OPEC and Russia fail to clear the global surplus, stirring speculation the curbs haven’t been deep enough and that rebounding U.S. supplies are canceling their impact. Prices have stabilized above $50 a barrel this month as diminishing U.S. inventories signal OPEC’s actions are finally having an effect. October Brent contracts, the front month on the ICE Futures Europe exchange, were at $52.56 a barrel at 5:28 p.m. in London on Thursday. That was 15 cents a barrel above the second month, November, which in turn has moved to a premium to the third month for the first time since 2014, when Brent traded for more than $100 a barrel. Spreads further out in time are also narrowing, with December 2018 versus December 2017 — known to traders as the “red spread” — having shrunk from $2.52 on July 10 to as little as 15 cents on Thursday. “The rebalancing of the oil market is happening, with demand catching up with supply,” said Jan Edelmann, an analyst at HSH Nordbank AG in Hamburg. Saudi Arabian Energy Minister Khalid Al-Falih pledged last month to constrain the kingdom’s exports this summer as OPEC’s biggest member seeks to lead the group by example. “People are betting that the Saudi promise to cut exports will have a significant impact on the supply side,” said Tamas Varga, an analyst at PVM Oil Associates. Not that OPEC and its partners can take all the credit, according to consultants Energy Aspects Ltd. Oil demand has strengthened, making up for patchy delivery of cutbacks by some other OPEC members, said Amrita Sen, the company’s chief oil analyst. Iraq has lagged behind other nations in implementing its curbs. The shift in the curve may also have some unwelcome consequences for the group. A premium on immediate supplies encourages traders to pull barrels out of storage, potentially compounding the short-term surplus. Although price spreads show OPEC is making progress, its ultimate objective of reducing inventories to their five-year average remains some way off. Inventories in developed nations were 252 million barrels above this level in June, the organization said in a report on Thursday.